The ketubah is a formal document at the Jewish wedding in which the couple defines their responsibilities to one another. 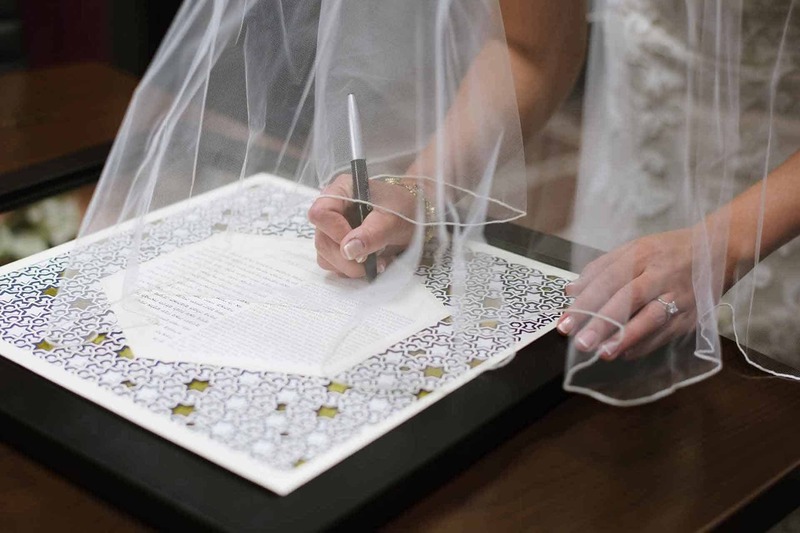 All traditions have a way of exchanging promises, often in the form of reciting vows at the altar, but in recent years, many couples who are not Jewish have also embraced the ketubah as a way to immortalize their commitment to one another in a work of art. The New York Times recently ran an article about this trend. When you really get down to it, the ketubah tradition is quite beautiful. Jewish couples have been doing this for thousands of years. It is a constant reminder in the home of the commitment a couple makes to one another. 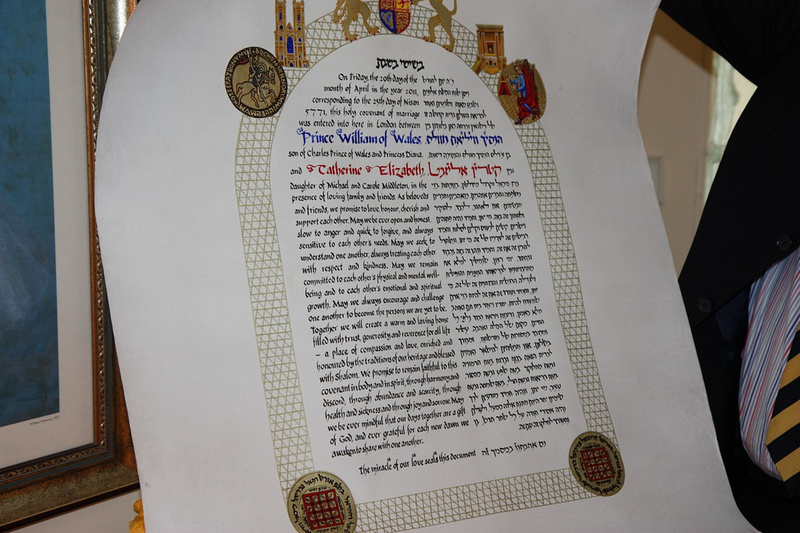 A famous somewhat recent example of a non-Jewish ketubah is the one made for the Royal Couple by Jerusalem based calligrapher Michael Horton for William and Kate’s historic 2011 wedding. This one was a gift from the artist to the royal family. 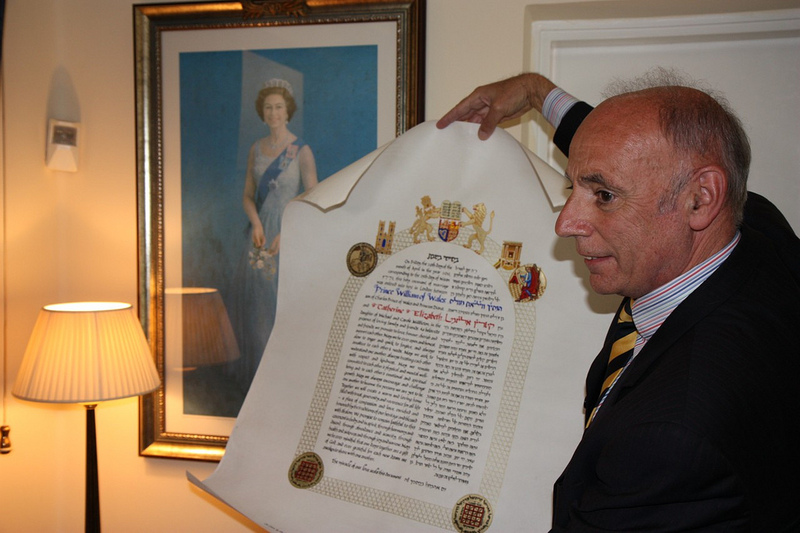 Strictly speaking, when a non-Jewish couple orders a ketubah, it is an homage to the tradition and not an actual contractual agreement as it is according to Jewish law. According to religion, Jewish couples use a very specific text in their ketubah in order for it to be kosher. A non-Jewish couple, however can use the same artwork paired with any text they desire because they are not bound by the contractual laws dictated in Judaism. Often it can be a poem coupled with their exchanged wedding vows. Quaker weddings have a very similar analogous document called a Quaker Wedding Certificate. Like in Judaism, it is used to seal the wedding, and is decorated with artwork. Quakers have been using marriage certificates since 1669, when George Fox, the founder of the Society of Friends married Margaret Fell. Like in the ketubah tradition, it was a way to expand the woman’s role and grant her a degree of rights. Whether or not Quaker wedding certificates actually stem from the ketubah tradition in Judaism is not known, but it is easy to imagine that it was.